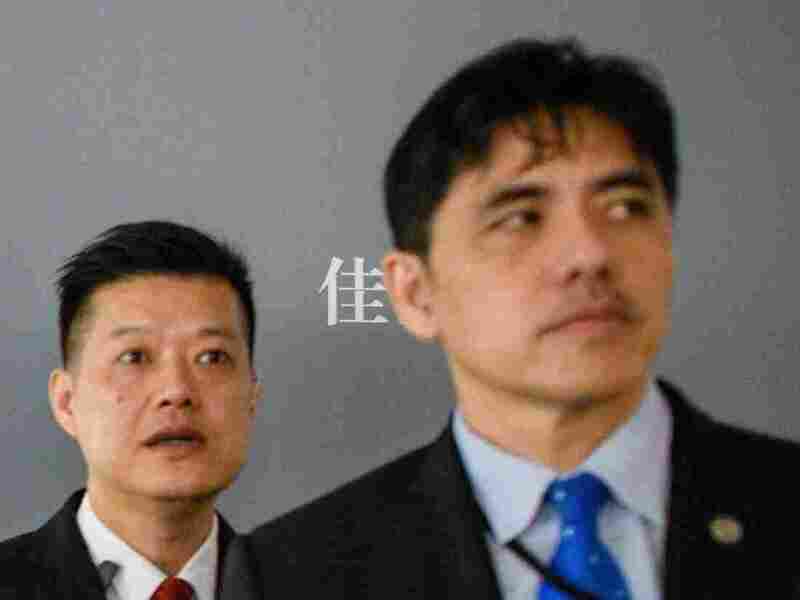 Former CIA Officer Charged With Spying For China : The Two-Way Jerry Chun Shing Lee left the Central Intelligence Agency in 2007, but in 2012, FBI agents searched his hotel room and found handwritten notes detailing the U.S. network of informants in China. This 2017 photo shows the man on the right, identified by local Hong Kong media as former CIA agent Jerry Chun Shing Lee, standing in front of a member of security at the unveiling of Leonardo da Vinci's "Salvator Mundi" painting at the Christie's showroom in Hong Kong. It is not known why the FBI waiting so long after uncovering the notebooks to arrest Lee; however, it is also not clear how frequently he traveled to the U.S., where his eventual arrest took place. The charges on Tuesday also included two counts of unlawfully retaining documents related to U.S. national defense. He faces a maximum of life in prison. "The allegations in this case are troubling," said Tracy Doherty-McCormick, acting U.S. attorney for the Eastern District of Virginia. "Conspiring with foreign agents poses a real and serious threat toward our national security." Lee's attorney, Edward MacMahon, denies the charges: "Mr. Lee is not a Chinese spy," he said after his client's initial court appearance in February. "He is a loyal American who loves his country." The New York Times has written that the information in Lee's notebooks is thought to have been used by Beijing to dismantle U.S. spy operations and identify informants inside China. Two years before the FBI searched his hotel room, the CIA had begun "losing its informants in China" to the tune, eventually of more than a dozen killed or imprisoned. "Some intelligence officials believed that a mole inside the C.I.A. was exposing its roster of informants. Others thought that the Chinese government had hacked the C.I.A. 's covert communications used to talk to foreign sources of information," according to the Times. "The indictment alleges that three years after Lee left the CIA in 2007, two Chinese intelligence officers approached him and offered to pay him for information, including documents on U.S. defense, until at least 2011. "The Chinese intelligence officers allegedly provided Lee with email addresses so they could communicate covertly. The indictment alleges that Lee made 'numerous unexplained cash deposits, and repeatedly lied to the U.S. government during voluntary interviews when asked about travel to China and his actions overseas.' "